The only thing I can imagine more disheartening to a student pilot’s ears than “I’ve got the controls” is something like “prepare to abandon aircraft”. It means you’ve screwed up, that you’ve taken the plane far enough beyond the instructor’s comfort that they feel the need to intervene for the continued safety of flight. I heard “I’ve got the controls” a depressingly many times today. I’ve always cursed my beginners luck – that habit I have of doing so well on the first go round that I create completely unsustainable expectations. Well, today, I brought expectations back in line. I mean, I wasn’t flying that badly. 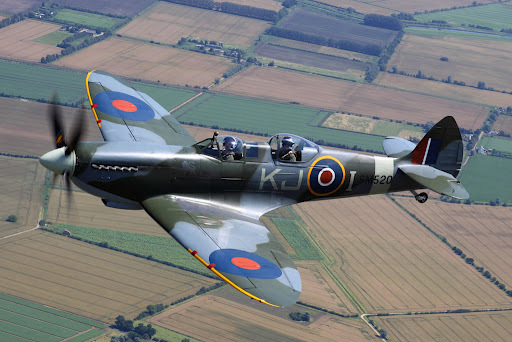 But I was flying like someone who had two hours of Spitfire time under his belt. Every time I’d nail airspeed, my altitude would go to hell. I get back on altitude, and my airspeed jumped out of range. And in the meantime, I forgot to set the boost pump, put the prop forward and drop flaps. Oh crap – and I was supposed to have started turning base back there unless I was expecting to demonstrate an off-field landing. Mind you – this wasn’t how Al phrased things. I will repeat again what a wonderful, patient, supportive instructor he is – except for those brief, urgent moments when I plummeted us towards terra firma, his words were understated and full of praise for the things I caught this time. But, let’s be honest: I flew pretty badly today. Not all badly, and by the end of the third sortie, Al seemed pleased: he admitted that, at the very least, I’d gotten back to the level I was flying at yesterday. First sortie: fresh as a daisy, with memorized procedures dancing in my head like sugarplums (yeah, I know that simile doesn’t even make literary sense, but bear with me – it’s been a long day). Taxiing out, I felt sharp – I was ahead of the plane and its positively medieval braking system. Even made the radio calls. Lined up, added power, and we were blasting into the air like we were born to fly. Smacked the first three legs of the pattern around (“Beautiful, beautiful…”) and completely fell apart turning base. I don’t know what it was, but by the time we’d bounced twice and Al called for a go-around, my brain was at least 10 seconds behind the plane. Never caught up. Al suggested that we go off and have some fun for the second sortie. His friends Dale and Andrea do aerial photography from a 182 – would I like to get some pictures from the air? They’d like to have their gas covered, but that was about it. Interested? Absolutely. 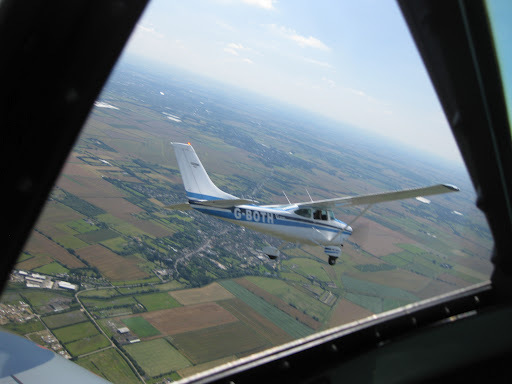 We rendezvoused over Cambridge and held formation for a few turns while Andrea squeezed off some shots. Okay, honestly, Al held formation (remember, he’s the fighter pilot). I just smiled at the camera and tried to look like I was doing serious pilot stuff. Then it was out into the open air of another gorgeous summer day. More wingovers, and I finally got the victory roll right. 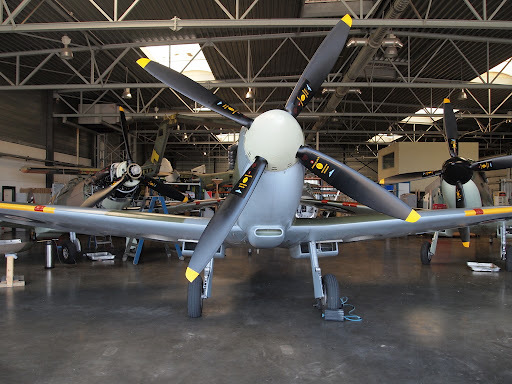 Al demonstrated a “PFL” – practice forced landing, cutting the throttle back to idle at 3000′ and spiraling us down disturbingly close to one of those picturesque English fields before blasting in 6″ of boost (that’s 36″ of MP at 2800 rpm, swinging four blades of a 10′ 9″ prop, for you pilotfolk keeping track of numbers). We climbed away over the hamlet rooftops in a – ahem, living legacy – clatter of pistons, and it was my turn. I overshot badly *and* let my speed get to high. I called it early, and Al was unconcerned (“No worries – find another field.”) but I’d painted myself into a corner of furrows and powerlines, so we added throttle in and clattered skyward again. Somewhere along the way – I think it was back in the pattern at Duxford, Al offered more advice about forced landings and field selection – there was something at the end about the farmer’s daughter, most of it pertained to controlling the impact with terra firma. But we were back in the pattern, and this is where everything fell apart. I lost track of everything I was doing wrong, and I could clearly detect some strain in Al’s voice as he stretched for things to complement me on after each successive bounce. We tried maybe five landings before hanging it up. Yeah, I felt like crap. The debrief was as gentle as Al could make it, and there were plenty of extenuating circumstances: the intercom was misbehaving, we had a dodgy crosswind, and the traffic pattern got surprisingly busy. But he couldn’t hide the fact: on my 20th landing, I was still failing to correct the same basic mistakes I’d made on my first. 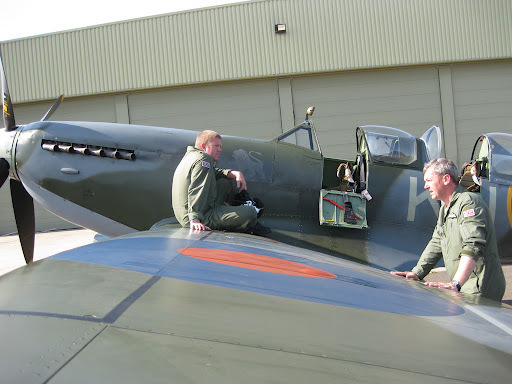 All those “Not bad for your first time in a Spitfire” rough edges had grown to unconquerable proportions. “We’ll take a little break? Strap in at 3:45 and try to get you back in the saddle?” I moped, I fretted. Those butterflies in my stomach had turned to wasps, biting and stinging. Honestly, right then, I didn’t want to go up again. But I did, and I’m glad I did. Taxiing out, a swarm of people pressed against the airfield railing, cameras clicking away at us. Just by firing up that 12 cylinder Merlin, we drew people like a dinner bell. I felt, momentarily, like a rock star – they were taking pictures of me. Then I remembered that 1) I wasn’t sure I wanted to be a rock star, and 2) I had an airplane to fly. But it gave me the shot of self confidence I needed, and for the first time that afternoon, I got somewhat in front of the plane again. Didn’t catch the pitch/power/altitude excursions as well as I’d like, but I think I think I think I’ve nailed the sight picture to actually land the damned thing. Last two landings of the day were better than survivable – Al ventured that they were actually pretty good. Okay – enough ineloquent whinging about was how the day went. There were so many wonderful parts, too. 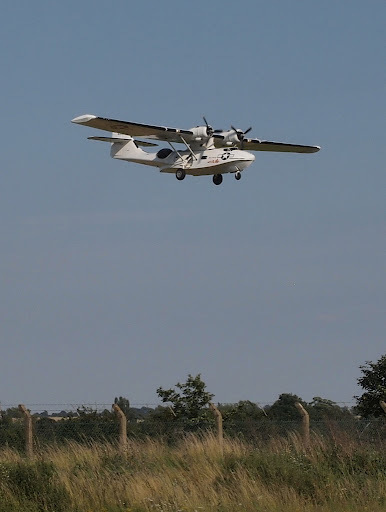 Every few minutes having a Tiger Moth, a T-6, a Dragon Rapide or…holy cow – is that a Catalina?!? – putter overhead. This is Duxford, and I was on the far side of the rail, walking among – and flying – pieces of history that I’d only ever before photographed with a telephoto lens. 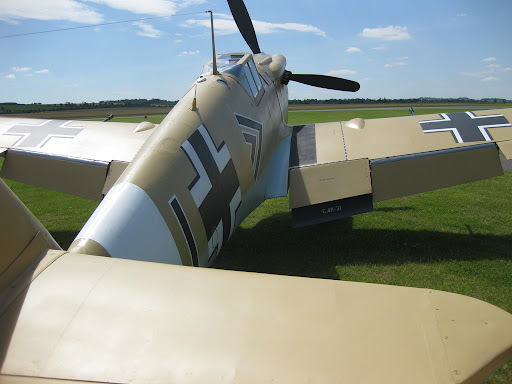 There were the conversations, swapping flying stories with folks like Cliff, who turned out to be Air Marshal Cliff Spink, who excused himself to go off and deliver a Messerschmitt 109 somewhere up north. As I was writing this, I paused for a moment to look out the window. The sun has left an impossibly purple and blue sky in its wake. 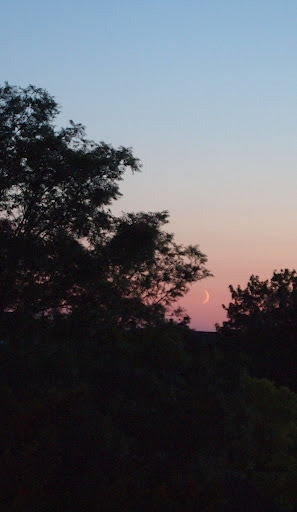 Just above the horizon, nestled into an opening in the trees, a crescent moon stands on end. It doesn’t look real – closer to something from a dream, or a Maxfield Parrish painting. And it reminds me how incredible all this really is.